This meatless stir fry is a quick, healthy choice when you want to eat light. 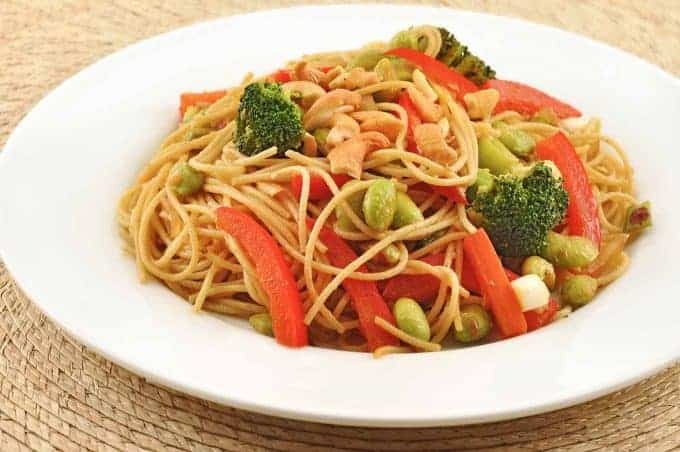 The nutty flavor of the whole wheat spaghetti blends perfectly with the edamame and cashews and helps to make this a really satisfying main course, even for meat lovers. It’s versatile too, so you can substitute other veggies for the red pepper, carrot and broccoli florets – we’ve listed a few alternatives in the recipe notes. 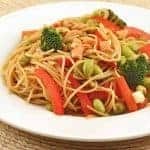 Whole wheat spaghetti combines with a stir fry of broccoli, carrot, red bell pepper and edamame for a healthy but hearty meatless meal. Cook and drain the spaghetti according to the package directions. Toss with 1 tablespoon of the sesame oil. 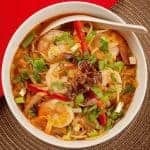 In a small bowl, whisk together the remaining 1 tablespoon sesame oil, rice vinegar, soy sauce, sugar and chili garlic sauce. Set aside. 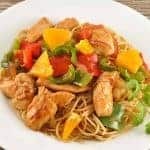 Heat the vegetable oil in a skillet or wok over high heat. Add the onion and ginger and stir-fry for 1 minute. Add the garlic and cook until fragrant, 30 seconds more. 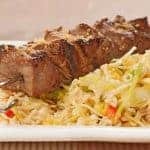 Add the broccoli and stir-fry until crisp-tender, 1-1/2 minutes. Add the carrot, bell pepper and edamame and cook for an additional 1-1/2 minutes. Add the sauce mixture and scallions and heat through, about 30 seconds. 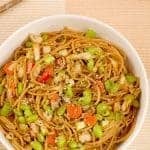 Immediately add the spaghetti and cashews, toss to combine with the vegetables and serve immediately. Feel free to mix and match the fresh vegetables in this dish to taste. Some other possibilities include green beans, asparagus, cauliflower and cabbage.